The global repercussion of the discovery of the citadel of Caral in the valley of Supe, a few years ago, put the eyes of the world in the archaeological complex located a short distance from Lima. 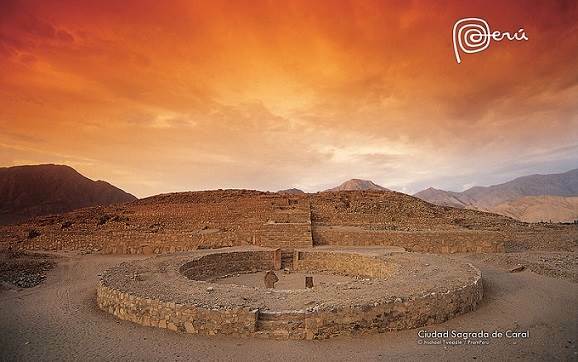 Today it is possible to make guided visits to the sacred citadel of Caral by taking a trip by car from Lima in approximately two hours. The citadel of Caral is found in the middle sector of the valley of Supe, province of Barranca, 184 km north of Lima. Archaeologically, it is the most outstanding urban settlement, due to its architecture, of all those identified in Peru between the years 3000 y 2000 b.C. It is a pride for Perú to be catalogued as the most ancient city in America and at par to civilizations such as Egypt and Mesopotamia. The sacred citadel of Caral is under the maintenance and supervision of the Special Archaeological Project Caral Supe; guided visits to its interior have an established schedule. Monday – Sunday from 9:00 to 17:00 hours. Starting in Lima, we take the Panamerican highway and go north up to km 160 where we arrive at Vegeta. We take a trail or rough road and travel 24 km more where we can observe irrigation canals in this desert area, beans, rough cane sugar and manioc crops in their interaction with the place’s communities. We travel along the north Panamerican highway, up to kilometer 184, just before the city of Supe. Then we travel 23 kilometers more towards the left margin where we reach a big sign that shows the way to the citadel of Caral. We take the bus going north until we reach the town of Supe located at kilometer 187 of the north Panamerican highway. There we can take collective taxis that go to the center of Caral citadel. The guided tour has a variable cost of between 10 y 20 soles. For the tour it is recommended to take wáter, sun protection gadgets like sun glasses, caps, umbrellas, sun blocker, etc. At the archaeological site there are bathrooms and a food area, so you can take your own provisions; only on weekends the neighboring settlers offer food. The citadel of Caral: among the principal architectonic appeals we find diverse constructions: 7 monumental pyramids, and they consist of an amphitheater, circular offerings’ burners, central squares, residential areas and religious centers; a guide will provide all the details in spanish. This citadel dates back to 5000 years ago and is chronologically dated in parallel to the Egyptian pyramids.